The Orbita mouse is an intriguing new product that embraces three different technologies: the wireless computer mouse; the scroll wheel and the digital compass. 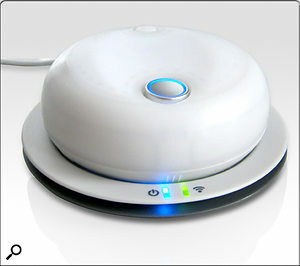 It's a is circular, donut-like device that communicates with a wireless docking station connected via USB to a computer. At its most basic level, you can move it up and down and left and right on a flat surface, just as you can with any other pointing device. But when it’s stationary, the device can be rotated like a scroll wheel, and numerous functions in software — from web browsers to DAW applications — can be controlled. But where does the digital compass come into it? Well, because the device can be spun, it needs to be constantly oriented in relation to the computer, so that 'up' is always 'up' even when the mouse has been spun 180 degrees. An arrow button on the top of the Orbita is used to re-calibrate the virtual North of the on-board compass. Instead of right and left buttons, the Orbita has two button ‘zones’, in the form of switches all around its edge, and an area outlined by a dashed grey line on its top. There’s a third button that doubles as an indent for scrolling that ensures the user’s finger doesn’t slip off mid-shuttle. All three can be set to control what would be the right, left or centre buttons on a standard mouse, using included software that works on PC and Mac. However, the Orbita works as a basic mouse straight out of the box in most cases without the need for the software. At the time of writing, the Orbita mouse wasn’t in full production; the manufacturers Cyber Sport were refining the grippiness of the base of the mouse, which needs to slide around the desk with ease but stay still when in use for scrolling. Cyber Sport say that the Orbita will be available to purchase on-line in January. For further details, and to see a video demonstration of the Orbita in action, head to the product’s web site.